This Friday, April 24 at 6:30 p.m., we invite you to the 1st Conference of Memory: other ways to remember the dead, which will take place in the Culture Classroom of Algorta (Villamonte). To reflect on this, we have planned different activities around the facets that surround death and mourning, including the process prior to it. After a brief introduction about the attitude of the contemporary Basque society before this topic, Kepa Kamiña will give a talk about death and accompaniment in schools. Afterwards, we will present a series of entrepreneurial projects against oblivion. First, La Huella de la Vida will talk about the possibility of leaving our fingerprint -our emotional and vital legacy- in the cloud, together with the explanation of the way in which each one wants to be fired and other desires. 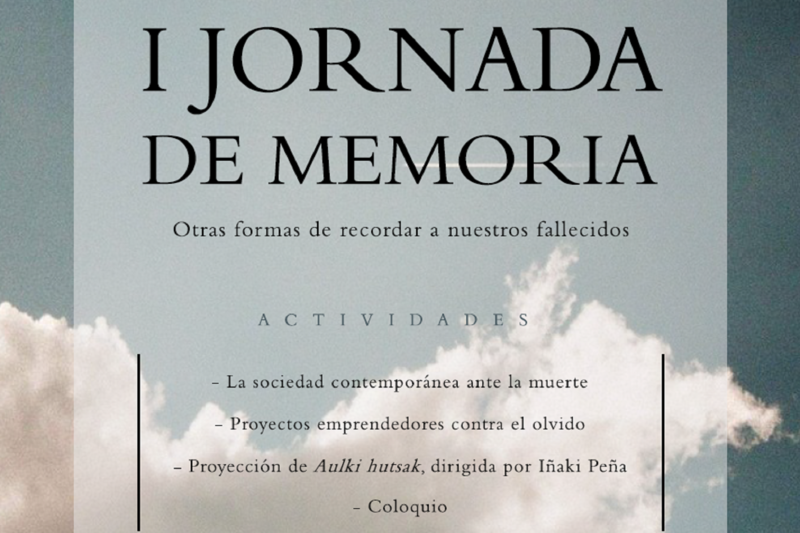 Afterwards, Panateneas will present their memory services -a kind of posthumous tribute- and civil funerals as an alternative to traditional ceremonies. Finally, Druyen will show us her funerary art as a way to keep alive the memory of the deceased through ceramics, with special emphasis on video-memories. Next will be screened the documentary Aulki hutsak (Empty chairs), produced by Arteman komunikazioa. We will have the presence of its director Iñaki Peña, hospitalization doctor at home. This film deals with death and the process of mourning in a natural way, breaking taboos and appealing also to symbolism. We will close the event with a discussion in which you are all invited to participate. There we wait for you!